Ringil, the hero of the bloody slaughter at Gallows Gap is a legend to all who don't know him and a twisted degenerate to those that do. A veteren of the wars against the lizards he makes a living from telling credulous travellers of his exploits. Until one day he is pulled away from his life and into the depths of the Empire's slave trade. Where he will discover a secret infinitely more frightening than the trade in lives. Archeth - pragmatist, cynic and engineer, the last of her race - is called from her work at the whim of the most powerful man in the Empire and sent to its farthest reaches to investigate a demonic incursion against the Empire's borders. Egar Dragonbane, steppe-nomad, one-time fighter for the Empire finds himself entangled in a small-town battle between common sense and religious fervour. But out in the wider world there is something on the move far more alien than any of his tribe's petty gods. Anti-social, anti-heroic, and decidedly irritated, all three of them are about to be sent unwillingly forth into a vicious, vigorous and thoroughly unsuspecting fantasy world. 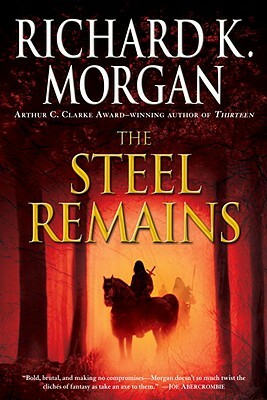 Called upon by an Empire that owes them everything and gave them nothing.Richard Morgan brings his trademark visceral writing style, turbo-driven plotting and thought provoking characterisation to the fantasy genre and produces a landmark work with his first foray.